… My own sense is that the view among academics and policy makers is not changing fast enough and some are just assuming that this would be a one-time event that will not be repeated in the future (even if we are still not out of the current event!). The comparison with the 70s when stagflation produced a large change in the way academic and policy makers thought about their models and about the framework for monetary policy is striking. During those years a high inflation and low growth environment created a revolution among academics (moving away from the simple Phillips Curve) and policy makers (switching to anti-inflationary and independent central banks). How many more years of zero interest rate will it take to witness a similar change in our economic analysis? Fatás succinctly lays out the problem. Interestingly, since the late 1990s, many have been concerned about “Monetary Policy in a Low Inflation Environment”, among them, Bernanke himself! For those interested, I provide a nontechnical essay from 2001 (with references within). Apparently, when “push comes to shove”, it was all forgotten! For the past seven years, Market Monetarists, under the guidance of Scott Sumner have proposed a monetary regime change. 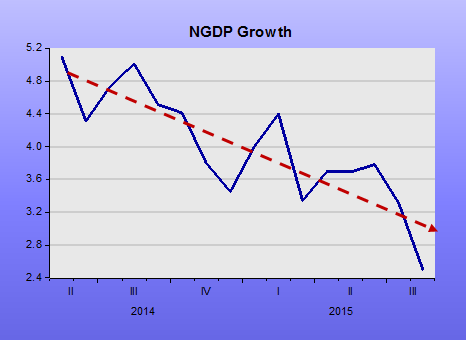 The new regime would have the Fed (and other central banks) level target nominal GDP. In a sense, this proposal simply involves making explicit something that was only implicit during the “Great Moderation”, being, in fact, responsible for that outcome. That´s good, because it won´t be a “shot in the dark”. We´ve been there. Over the past seven years, people who never thought themselves as “market monetarists” have come out in favor. For example, Christina Romer, a former Obama head of the CEA and Harvard professor Jeffrey Frankel. Even Simon Wren-Lewis, a pillar of the New Keynesian school, is coming around to the idea. There is however, one lose end. There´s a view that over the past five years, after partially recouping from the “Great Slump”, the economy lives through a “Great Moderation 2.0”. Unfortunately, the “GM 2.0” is also viewed as the “Great Stagnation”. This is where the “Level Target” attached to “NGDP Targeting” comes in. To make the idea clear, I put up a set of charts that compare the “golden age” of the “GM 1.0”, the five years from 1992.IV to 1997.IV with the five years of the “GM 2.0”, from 2010.III to 2015.III. Houston, we have a LEVEL problem! Another point: Fatás mentions the change among academic economists, who moved away from the Phillips Curve. Now, we have academics in the Fed, like Yellen and Fischer, moving back to Phillips Curve thinking, while not abandoning inflation targeting. Note that the unemployment rate at present is the same low rate of unemployment as in 1997, while inflation, both in 1997 and today are below the target level. 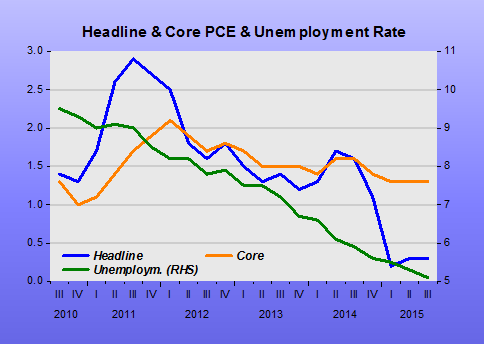 In both instances, unemployment fell together with inflation! However, the unemployment then and now are not comparable magnitudes. 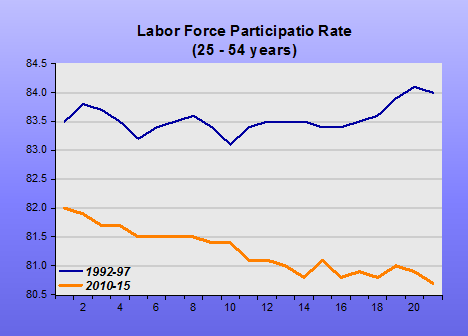 Just look at the very different behavior of labor force participation in the two periods. The fact that a crisis can be so persistent and that cyclical conditions can have such large permanent effects on potential output. Would lead us to say that, after 7 years, the original trend may not be attainable any longer. However, a trend level between today´s level and the level that prevailed all the way to 2007 may be feasible. That´s the conventional phrase structure most used by the Fed, the media and analysts. Everything that some “think” will “pick up” is in fact going down! … There is a growing chorus of people who believe that they are doing unseen harm by not normalizing monetary policy. There will be a couple more employment reports and the second estimate of Q3 GDP before the next FOMC meeting in mid-December, so time and data will tell! … Macroeconomics should be about aggregates, not components of spending. Yes, changes occurring in the various components of GDP can impact interest rates, and thus velocity. And if monetary policy is inept (i.e. doesn’t offset changes in velocity) that can impact nominal spending, but it certainly isn’t the most illuminating way of looking at the issue. It’s like trying to explain changes in the overall price level by modelling changes in the nominal price of each good—theoretically possible, but a waste of time. And what are the aggregates saying? They are reflecting the visible harm monetary policymakers are making through tightening monetary policy by “word of mouth”! Echoing Friedman, Bernanke once said: To gauge the stance of monetary policy, look at what´s happening to nominal spending (NGDP or Nominal Final Sales, for that matter) and inflation. And the message is clear! Thirty years and counting, but reasoning doesn´t change! Maybe this “analytical calamity” comes from “price and quantity-based” reasoning. The quality of public debate on economic issues is rapidly degenerating to the level of intellectual barbarism. Contradiction has become the mark of sophistication, evidence is dismissed as irrelevant, and “experts” are defined as anyone who advised the government during some economic catastrophe. Indolent journalists lean on an imaginary consensus, claiming that “most economists agree” about this or “Wall Street worries” about that. Economic policy has never before been so thoroughly dominated by ever-changing economic theories and forecasts. Economists who can’t predict the next month now propose to fine-tune the 1989 budget or the 1986 inflation rate. There is a panicky political impulse to fix things that are not broken and ruin things that were almost fixed. Always, the rationale is that “most economists agree” that “something” must be done. If economists were actually guilty of believing half of the strange ideas that are attributed to them, it would be safer to base economic policy on astrology. An increase in the FF target rate is “a pill that must be swallowed”! The hope is that the inventory swing is just temporary, and that GDP will soon be moving along at a strong enough clip that the economy will have no problem swallowing a rate increase. The concern is that businesses cut inventories because they are worried that the global slowdown will hurt them, and that those qualms will affect their hiring decisions. The GDP figures might mask what’s happening with demand, but sometimes the mask matters. Unfortunately, it´s not masking anything. 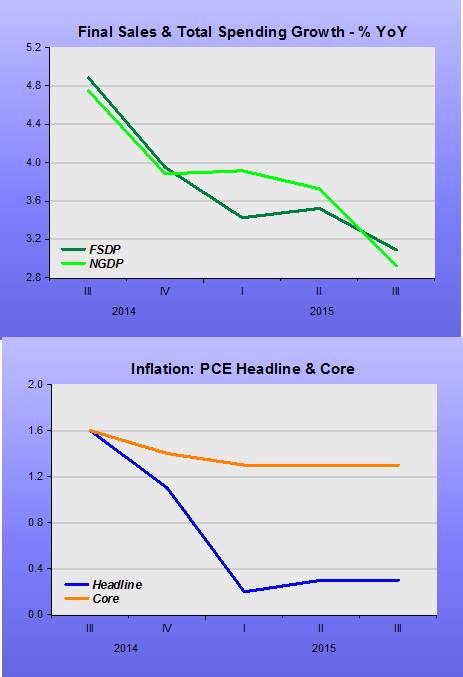 Final nominal sales (FSDP) follows closely on the heels of nominal spending (NGDP). They´re both chasing “zero” growth! 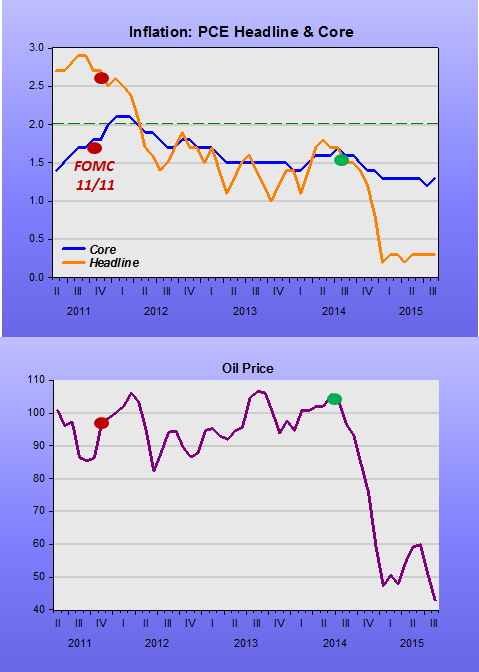 And while the Fed has confidence that inflation will “move towards target”, it has moved away and stayed away. Furthermore, with (“unmasked”) demand weakening by the quarter, there´s no chance it will do so! Twitter is great. It gets to the nub of issues quickly. No messing. Every time I propose NGDP Targeting the heavyweight sophisticates immediately come back like here and here. with “you can’t target that because of the huge revisions”. It got me thinking about what these twitterati would target. The inflation target is perhaps the worst of all. There is little agreement about which inflation rate to choose. Rightly so. It’s way more complex than facile economic commentators think. Should the rate be the one faced by the average consumer? The average consumer is a tricky concept to start with, as we all know. Perhaps the median consumer? Core inflation, excluding volatile items like food and energy? No small debate there! And lives depend on it as central banks often seem to regard high headline inflation inflation as a justification for raising rates, trumping core rates. And then low headline inflation rates are somehow to be ignored and instead a focus on core inflation, or even core inflation expectations a very long way out. Housing costs are 30-40% for the average consumer. And they are very sticky. Incorporating “inflation” in those housing costs is immensely tricky, either tracking sticky prices like rent, and of then of course separating out changes to the quantity and quality of what is rented. Or, even worse where there are a lot of homeowners, you need to measure inflation in imputed rent (ie the purely inflationary element of the theoretical benefit homeowners get from owning their homes, again stripping out those pesky quality and mix changes). the UK ONS has been criticised for not measuring housing inflation properly, but it is hard to do. Or should expected inflation be used? Perhaps this has the benefit of never needing to be revised. But there are numerous versions of expected inflation. Short, medium and long term. Consumers expectations, business expectations. These are very different in the UK at the moment. Or market-implied expectations? But expectations of what? 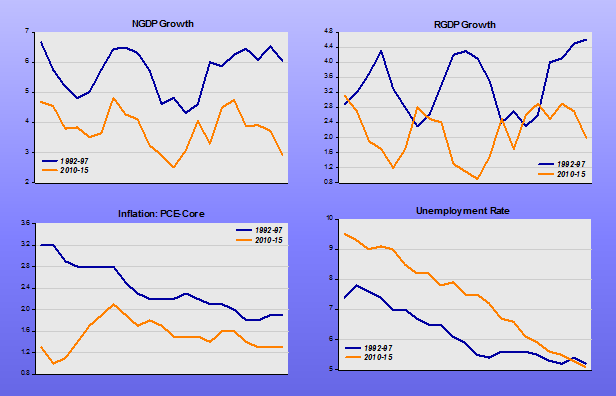 CPI, RPI, Core CPI, the deflator? And here we have some genuine issues about reliability anyway, as neither the government or the central banks don’t like it they don’t really focus on helping improving the efficiency of this market. The table from the BoE August report illustrates the “pick a number” problem. If we really want to improve national well-being we need more output, more wealth, so the inflation rate that really needs to be divined is the output deflator: how we move from nominal value of output to real output, stripping out inflation. Then somehow target not having too much of that sort of inflation. That deflator is not an easy measure either. The same hedonistic challenges apply, i.e. how does the quality of output change over time. The same mix effect causes huge challenges as economies are both complex and highly dynamic. Eighty percent of most modern economies produce services, not goods. Inflation in service sector output is no easy thing to measure, e.g. Housing output from existing houses (10% of a modern economy by value added)? Output from the government in terms of schools, hospitals/defence and bureaucrats (about 5% each)? Distribution (15% of a modern economy)? To say nothing of banking, insurance, legal services, IT, pointless celebrities, etc, etc. An excellent essay by Geoff Tily of the UK’s ONS demonstrated the challenges of measuring either service sector output and its deflator. 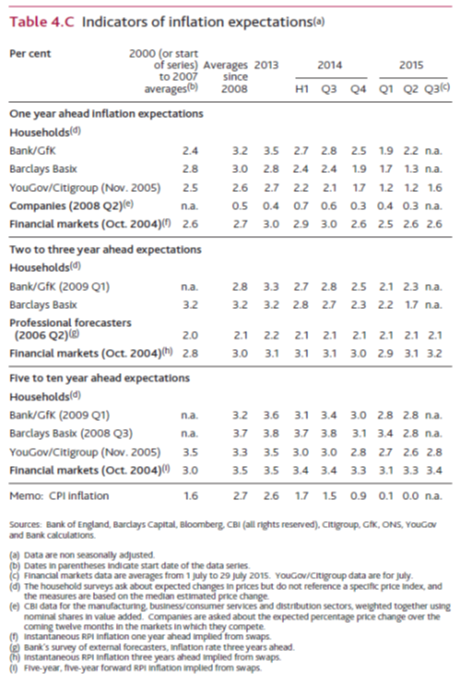 UK CPI is the least reliable measure to target: it’s never even gets revised! Laughably, in the UK the Consumer Price Index is targeted by the Bank of England. This index is a political and contractual one, as it used to set welfare and pension increases, the return on index-linked bonds, for inflation swaps, and often in wage negotiations. Some clever people think it is reliable because it is never revised. This is a really foolish argument. The lack of revisions demonstrates its political and contractual importance, but also proves it is not a reliable measure of what is happening in the economy. Only economic measures that get revised are reliable as they demonstrate a proper respect to the difficulties of measuring macroeconomic variables. No respectable professional macroeconomist should use it in any model of how the economy works. So what about targeting output? Well the clever people spot the problem. It is often revised. Partly due to revisions of the physical output, partly due to revisions of nominal output (by value), partly due to the deflator, partly due to mix changes, methodological changes, even mistakes. Revisions are the output number’s strength, not it’s weakness. It is constantly improved upon, unlike the joke macro number of the UK CPI. Critics are right that targeting a number that gets revised is a problem, but that is why you should look through the problem and target expectations for the number. If there is a rationale for targeting inflation expectations, it can be applied to output too. Expectations can’t get revised, they are updated, and do influence actual behaviour. If output growth is expected to be robust people will act differently to if they expect it to be poor. Historic price numbers or output numbers are the rear-view mirror. You can’t drive by looking behind you. There are a host of subsidiary numbers that could be targeted like wages, employment, business surveys etc., but none provides the full picture of a dynamic economy, and are all flawed for that reason. Perhaps nominal wage growth could be targeted as that is at the heart of the problem of macroeconomics, unemployment being caused by downwardly sticky wages during a turndown in aggregate demand. I feel just targeting nominal wages might be a bad thing as it could end up being gamed or rather indexed, but it is worth thinking about. Employment, or rather unemployment, could be targeted. But just look briefly at the almost endless debates about labour force participation rates, especially in the US; about the quality of the employment, especially in the UK; or about the real number of unemployed, especially in countries with large informal economies and easy unemployment registration. Unemployment is not the answer. Perhaps, expectations of unemployment? Derivatives of output, like output per head, or output per hour (ie productivity) could be targeted but these obviously suffer from the challenge of first measuring real output reliably. In addition, I am not sure how or who would target expectations of output per head or per hour. Real output or nominal output? And there is the final measurement challenge. If measuring nominal output is tough and measuring the deflator is tough, measuring a derivative of the two is more than doubly tough (RGDP=NGDP/Deflator). I know that some chunks of RDGP are measured by measuring actual stuff produced. Officials do gather data on the oil pumped out of the wells, the cars coming off the production line, or bushels of wheat from the farms. But extraction industries, manufacturing and agriculture are a very small fraction of any economy these days – even in an industrial powerhouses like Germany. So, which output number should be targeted, a real or a nominal one? Both. Governments (or rather “society”) should target (be concerned with) real output, the creation of wealth. Central banks should target expectations for nominal output (NGDP), i.e. the value of the real output measured in money terms – assuming a steady growth in nominal output is a good thing, which most people do. The balance between nominal growth and real growth, inflation, can then be left for society to figure out. In other words, the underlying idea of the wage Phillips curve still stands. It’s just a matter of using measures that fit the time. As Matt Phillips (no relation to William presumably) points out in his Quartz piece on the curve, the labor market has changed quite a bit since the mid-1970s. He points specifically to the decline in the unionization rate, which is a sign of the decreasing bargaining power of labor in the economy. A 5 percent unemployment rate when labor is relatively much stronger, for example, is very different from a 5 percent unemployment rate when labor is on the back of its heels. Changes in the labor market might be a reason why increases in wages and salaries don’t pass through to overall inflation as much as we might have thought. Back when labor had more bargaining power, wage hikes would bite more into profits and therefore spur companies to raise prices. Now companies have more of a cushion, so a similar wage increase won’t necessarily lead to as strong of a price increase. Context appears to very much matter. Policymakers will always need to create rules of thumb to help them make sense of an incredibly complex economy. But those rules need to be updated as the world changes. That´s all very nice, but is it useful? In other words, can´t we come up with a “rule of thumb” that is “timeless”? 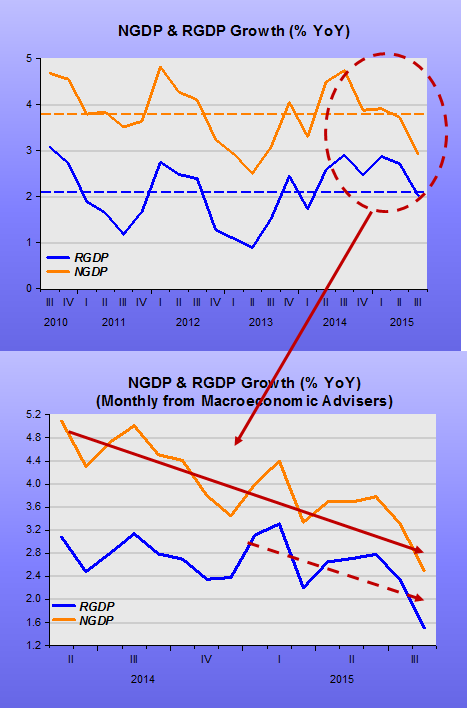 The NGDP-LT growth rule may qualify. 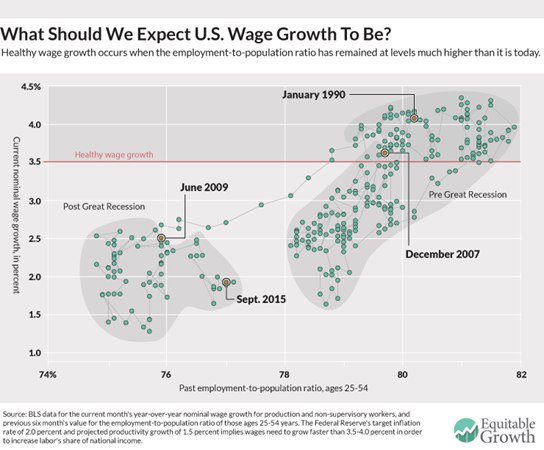 In the chart below, I use the same graphic strategy, but instead of charting wage growth and the prime-age employment population ratio, I substitute wage growth for NGDP growth. 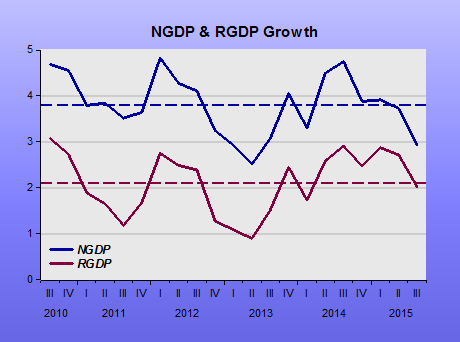 It appears that what´s driving both the employment ratio and wage growth is NGDP growth. 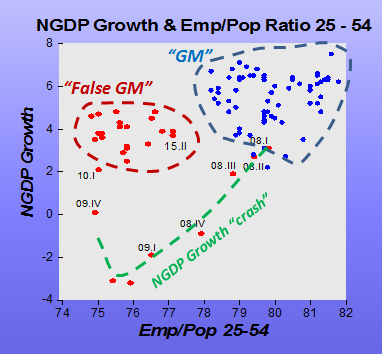 While during the “Great Moderation” (“GM”), NGDP growth evolved along a stable level path, by letting NGDP growth crash in 2008-09, the Fed afterwards put it on a lower path, which is why I name it the “False GM”. The coincidence of the fall in the employment ratio to the crash in NGDP growth makes the argument that the fall in the employment ratio is mostly due to structural/demographic factors hard to swallow. In his post, Nick Bunker says “but those rules need to be updated as the world changes”. He´s referring to adopting a modified Phillips Curve (PC) concept. Unfortunately, that likely won´t help. Over the last 50 years, no relation has been more modified, refined and specified than the PC, and it still doesn´t work! As I argued in another post, it is time to abandon “estimation” and do some “experimentation”. 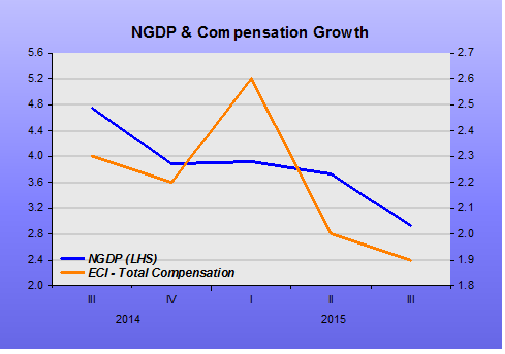 The chart gives a clear pointer: try putting NGDP growth on a higher path. The result will likely be a higher labor force participation and higher wage growth. If it is done right, inflation getting “out of hand” shouldn´t be a worry! 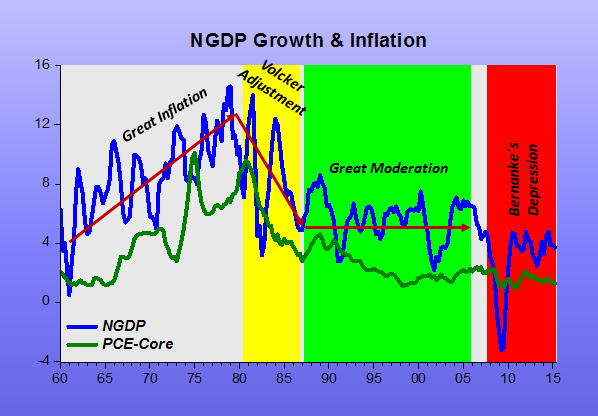 The chart below shows how the Fed was successful in bringing the NGDP growth path down to conquer inflation and reap the Great Moderation. Now it has to do the opposite and make the red band look more like the green band!